Ok, this was rather easy but it was a finish just the same. The only problem I ran into was the fact that it wasn't mentioned to stop beading a certain distance from the top of the fabric so I had beads that kept getting caught on the foot of my sewing machine. That was about the only grumble I had though as the final bits of finishing went smoothly. 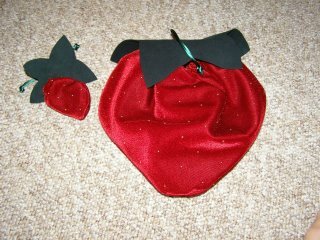 I again have the small one we were given completed at last year's Christmas party so I have a pair of strawberry bags, one as useless as the other as far as using them as actual bags but they look cute. I also got a bit of work done on Baroque this weekend but I forgot to take a pic of is this morning as I hurried about so I will have to save that one for tomorrow. The bag is lovely, very nice finish. Useless or not, they are just precious!!! Wonderful finish, you done a awesome job!! !